@RussellJClay runs through his favorite plays for this week's football action. Follow Cafe experts on Twitter @dfcafe! @Spencer_JL calls out his top QB options for Week 9. @BigItaly42 takes a look at running backs for Week 9. @BigItaly42 locks in his top WR options for Week 9. @BigItaly42 locks in his top stacks for Week 9. @RussellJClay runs over his favorite DraftKings cash game and GPP options for this week's football action. 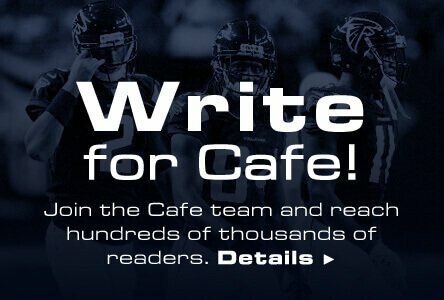 Follow Cafe experts on Twitter @dfcafe! @JGuilbault11 dives into this week's top Cafe Value plays. @JGuilbault11 narrows down his top cash & GPP options at tight end this week. @JGuilbault11 dives into this week's FanDuel optimal lineup. @JGuilbault11 takes a look at cash & GPP plays for Week 9. @JGuilbault11 talks cash & GPP defenses for Week 9's action. @BigItaly42 breaks down cash, value, and GPP options for Week 8. @RussellJClay breaks down his top RB options on DK for Week 8. @JGuilbault11 reviews this week's optimal lineup and stack for cash and GPP contests.